Four Seasons offers a wide variety of quality swim programs for our members of all ages. Whether your baby needs an introduction to the water or your pre-school child needs to learn to swim, our youth swim program is the best in town. If you need to learn to swim as an adult, or just fine-tune your technique, you’ll find our experienced and accommodating staff very knowledgeable and excited to help you find your comfort in the water, or train to compete in triathlons. All Four Seasons Swim Instructors are CPR trained and Starfish Aquatics Institute Certified. With low instructor-to-student ratios, you can be sure that your child will be well cared for in the pool and can learn at their own pace. In addition to the North (leisure) Pool, our South Pool is a 6-lane Lap Pool kept at a comfortable 80-83 degrees to cool down even the hardest working lap swimmer. Swim Skills Assessment for new members going into a swim program (kids only) FREE! Each participant/swimmer needs his or her own Myiclubonline.com account if they are signing up during Open Registration. Classes are filled based on a first come, first served basis. Want to follow along with your progress and swim levels? Click here to view our Learn-to-Swim Skills Sheet to keep track of the skills learned throughout your lessons. (Each swimmer will also receive a pass card at the end of each session). Please note: All placements are final during registration, no changes can be made after the participant is registered. Registration fee is non-refundable and non-transferable. When registering, please register under the child’s name. For each swimmer, there is a limit of one lesson per week. Learn to swim in a group setting. In these classes, you will learn front and back floats, beginning swim strokes, and building comfort in the water. Beginner (brand new to swimming) and Intermediate (previous adult swim lesson experience, needing work on kick, strokes & forward movement) lessons available. 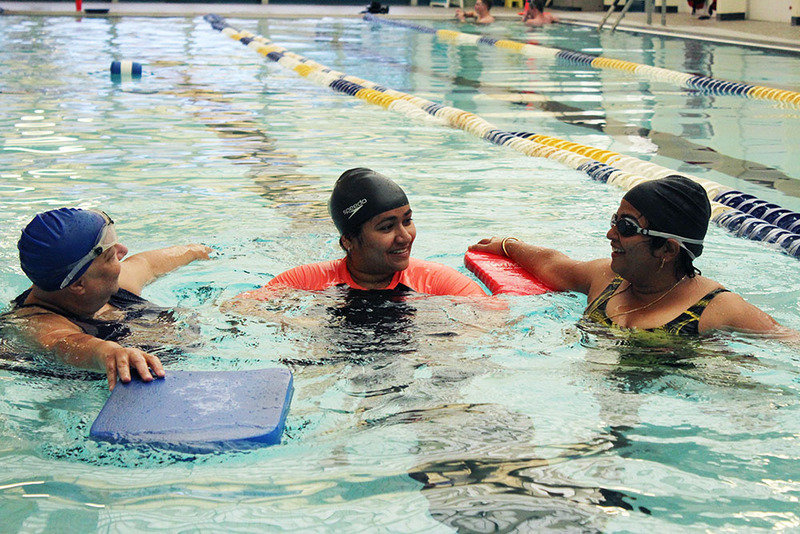 Groups are limited to 4 adults to ensure the participant’s safety and class quality, while learning the fundamentals of freestyle and other stroke coordination. Bring a friend (member or non-members welcome)! When your friend registers for an Adult Group Swim session, you’ll receive $10 off your registration fee (current session only). Applies ONLY to NEW Adult Group Swim participants. Please visit the Front Desk for more information.